January 26 – Obtained Syl Apps and Sheldon Kannegieser from the New York Rangers for Glen Sather. January 31 – Obtained Jean Guy Legace from Buffalo for Terry Bell. • Penguins had an 18-game (0-11-7) road winless streak from October 25 through January 14. 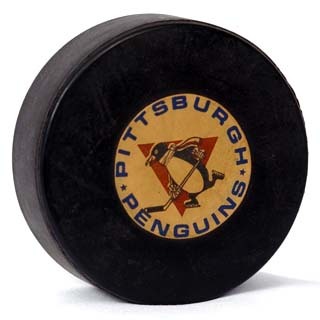 • Pittsburgh’s 9-1 victory over the Detroit Red Wings on December 19 was the largest margin of victory in team history. • Penguins had a seven-game home winning streak from January 13 through February 13. • Greg Polis was named to the Western Division All-Star Team. • Les Binkley recorded his 11th career, and final, shutout on March 3. • Jean Provonost scored five points (2+3) on March 24 vs. Detroit. • Penguins set a home record with 18 wins. • 20 ties is also a Penguins’ team record.